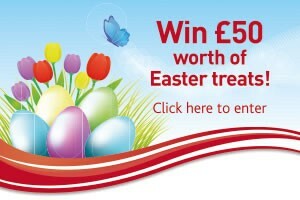 We are delighted to be launching this year’s Easter competition. We have scoured the Northwest’s leading Chocolatier’s to find our lucky competition winner £50.00 worth of Easter Treats to die for! To be in with a chance of winning this fabulous prize, all you have to do to enter is fill in your details below or Like us on Facebook. Your details will be entered into our draw and the winner will be announced on Monday 30th March 2015 * T&C’s apply. This article was added on Thursday, March 19th, 2015 at 4:31 pm and is categorised under Cheshire News, Chester News, Competitions, General News, Macclesfield News, Northwich Events, Runcorn News, Warrington News, Winsford News. Both comments and pings are currently closed. Error: Error validating access token: Session has expired on Saturday, 09-Mar-19 13:12:58 PST. The current time is Thursday, 25-Apr-19 21:46:26 PDT.